President Donald Trump went to Dover Air Force Base in Delaware on Jan. 19 to pay tribute to the four Americans who were killed in a suicide bombing in northern Syria. “Will be leaving for Dover to be with the families of 4 very special people who lost their lives in service to our Country!” he wrote on Twitter before his trip. In December, Trump announced that he planned to withdraw 2,000 U.S. troops from Syria. He reiterated later that the pullout would be slowed, as he tries to ensure the safety of Kurdish allies who are at risk of attack from neighboring Turkey. The United States believes that fighters from the ISIS terrorist group were behind the attack that killed the four Americans. 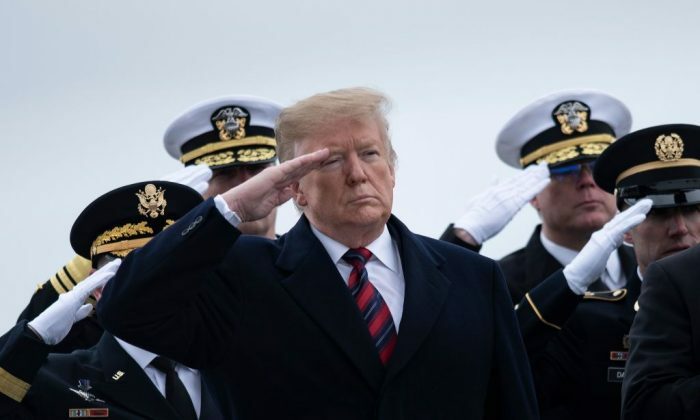 Flanked by military officials, Trump and other U.S. officials filed up a ramp leading onto a military transport aircraft, where a prayer was offered to honor the memory of Scott Wirtz, a civilian Department of Defense employee. Trump filed down the plank and saluted while six service members carried the casket holding Wirtz to a waiting gray van. In addition to Wirtz, those who died during the Jan. 16 attack in Manbij, Syria, were Army Chief Warrant Officer Jonathan Farmer, 37, of Boynton Beach, Florida, and Navy Chief Cryptologic Technician Shannon Kent, 35, from upstate New York, the Department of Defense said. The Pentagon didn’t identify the fourth person killed, a contractor working for a private company. U.S. media identified her as Ghadir Taher, a 27-year-old employee of defense contractor Valiant Integrated Services. Meanwhile, in Congress, things were still at a standstill as the government shutdown stretched into its 30th day. On Jan. 19 Trump outlined a compromise, which primarily sought to provide temporary protection from deportation to some 700,000 illegal immigrants in exchange for $5.7 billion in border wall funding. But House Speaker Nancy Pelosi (D-Calif.) rejected his proposal out of hand. Trump has been the only side to offer a compromise so far.